When I was little I thought Lev Gonick Fudge was a standard flavour like Russian or Whiskey Fudge. There were certainly lots of things that we ate at home that no-one else seemed to have heard of, but which I understood to be due to cultural differences between New Zealand and America. I was quite old when I realised that, really, even in America no-one knew about Lev Gonick Fudge. That's because Lev Gonick was not actually a culturally exotic flavour but the name of the teenage boy who developed the recipe, one of my babysitters in Canada, where I lived until I was three. This is such a simple recipe that I learned to make it when I was about 5 years old. It's also delicious, and quite robust, surviving pretty much any variation you can throw at it. But don't bake it too long, which is what I did yesterday, or goes rather on the tough end of the chewy spectrum. It's still yummy, but you have to work quite hard at it, and with fragile teeth like mine, that's not the kind of workout you necessarily need. The resulting version of Lev Gonick has a heavenly, ethereal quality from the marzipan flavouring. It smells divine but tastes delicately (rather than intensely) of marzipan which is a bit at odds with the shoe leather texture. 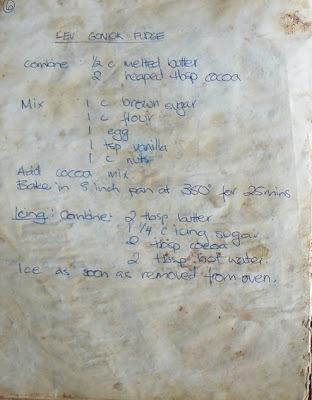 Here is the original recipe copied from my old recipe book, recently unearthed from storage with glad cries. It's an ideal sweet to make when you are craving brownies but want to bake with cocoa instead of solid chocolate. Add the cocoa mix to the rest of the ingredients, mix well. Bake in an 8" pan at 350 degrees for 25 mins (or just until firm). Ice as soon as removed from the oven. When smooth and glossy spread over hot fudge. Wait until cool and firm before eating (if you can resist that long). I find my favourite recipes by turning to the pages stained cocoa. Melliors this fudge looks so good and I have been craving it since I saw the picture posted. I have the ingredients and am going to make it tomorrow night. I will post back how good it is.